The “Fire Battalion” is as diverse as the community in which it’s located. The Army Reserve Officers’ Training Corps (ROTC), as it exists today, began with President Wilson signing the National Defense Act of 1916. Although military training had been taking place in civilian colleges and universities as early as 1819, the signing of the National Defense Act brought this training under single, federally-controlled entity: The Reserve Officers’ Training Corps. Army ROTC is the largest officer-producing organization with the American military, having commissioned more than half a million second lieutenants since its inception. 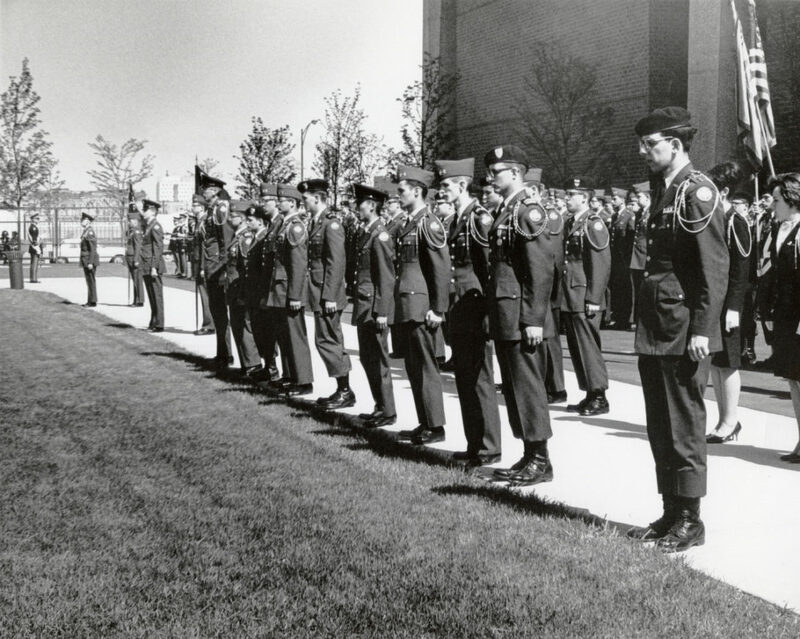 The Chicago ROTC Fire Battalion was established in 1947. In 1965, the university campus moved from Navy Pier to its present location. During the Vietnam Years, the Fire Battalion was still a detachment of the University of Illinois at Urbana-Champaign. However, by 1976, UIC Fire Battalion was officially recognized as a separate, distinct unit from the University of Illinois at Urbana-Champaign. Many of the city’s smaller schools and universities were cross-enrolling in the UIC ROTC program. On 17 May 1991, the Loyola-DePaul Battalion commissioned their last 5 cadets and folded their colors. The Fire Battalion assumed responsibility for the cross-enrolled students from Loyola and DePaul Universities, as well as Northeastern Illinois University and Northwestern University. Shortly after, Chicago State University folded their colors, as did Illinois Institute of Technology. In 1996, the Fire Battalion became the host ROTC unit for all of the Chicago area. In 2012, the Loyola Battalion uncased their colors and became Chicago’s second host school. UIC ROTC was thus responsible for the programs at UIC, Robert Morris University, Roosevelt University, Columbia College, Illinois Institute of Technology, University of Chicago, Chicago State University, Indiana University Northwest, and Purdue Northwest. UIC ROTC has an active and diverse cadet population of 165+ cadets. Our cadre and staff train and commission approximately 25 cadets a year.